Adrenaline Skydiving Sydney? If adrenaline is what you are after then we've got just the thing for you to do this weekend. Break Loose is proud to be associated with the most professional skydiving outfits available in and around Sydney. 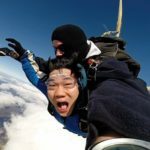 With this knowledge in mind you can research the tandem skydiving experiences below and book your next adrenaline packed skydiving experience in Sydney. 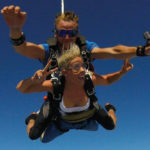 Located south-west of Sydney on the Hume Highway near Picton you'll find an amazing skydiving centre, Sydney Skydivers. These guys have been in business skydiving over Sydney for many years. In fact they are probably the oldest skydiving outfit in Sydney. Professional to the core, they will look after you and give you the time of your life. 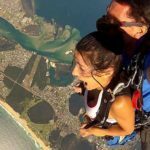 Just south of Sydney, on the beaches of Wollongong is perhaps Australia's largest skydiving outfit, Skydive Australia. Starting out in Wollongong some 14 years ago this group now operates skydiving experiences all over Australia. But their Wollongong drop zone is amazing. Its the only tandem skydiving experience with a beach landing in Sydney. Both of these drop zones offer a similar skydiving experience as far as the nuts and bolts of it goes, but of course, there are differences. Picton location has its own airstrip so you don't need to board a shuttle to get to an airport. You take off and land in the same location, ie Picton. Wollongong has a maximum jump height of 15,000 feet. Thats 1,000 higher than Picton (at 14,000 feet). Higher altitude gives you longer free fall – an extra 5–10 seconds. When you are travelling at terminal velocity that extra time is amazing. Wollongong offers views up and down the Illawarra coast. Picton drop zone has a country feel with views of the local farming community, the amazing Blue Mountains also form part of the back drop. We think both locations are pretty special and if it comes down to price then the facts speak for themselves below. Other locations you could consider are Goulburn, another 60 minutes past Picton, between Sydney and Canberra. Definitely worth considering if you are travelling from Canberra. Heading north there are tandem skydiving drop zones in Newcastle and the Hunter Valley. Of course you can head up the coast further to the mid north coast and Coffs Harbour, or further still to Byron Bay.